BRAZIL: Millions Of Irreplaceable Artifacts Destroyed In National Museum Fire, Officials Blame Funding Issues - Joe.My.God. Officials in Brazil have blamed lack of funding for a huge fire that has ravaged the country’s National Museum. 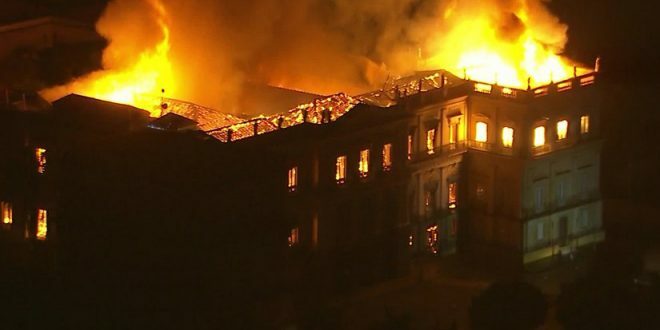 One of the largest anthropology and natural history collections in the Americas was almost totally destroyed in Sunday’s fire in Rio de Janeiro. There had been complaints about the dilapidated state of the museum. “We never had adequate support,” its deputy director said after the fire. No injuries have been reported but most of the 20 million items the museum contained, including the oldest human remains ever found in the Americas, went up in flames. Most of the human toll came in the form of grief and tears as employees, researchers and academics flocked to the scene in Rio de Janeiro. A fierce blaze has engulfed Brazil’s National Museum in Rio de Janeiro which housed millions of unique, historical items.